The new version of the 9500 features faster more accurate printing at up to 14″ width. With 10 pigment based inks, it offers similar performance to the much larger iPF6100 we reviewed last year. Keith has been looking at how it performs as a photographic printer for high quality printing. 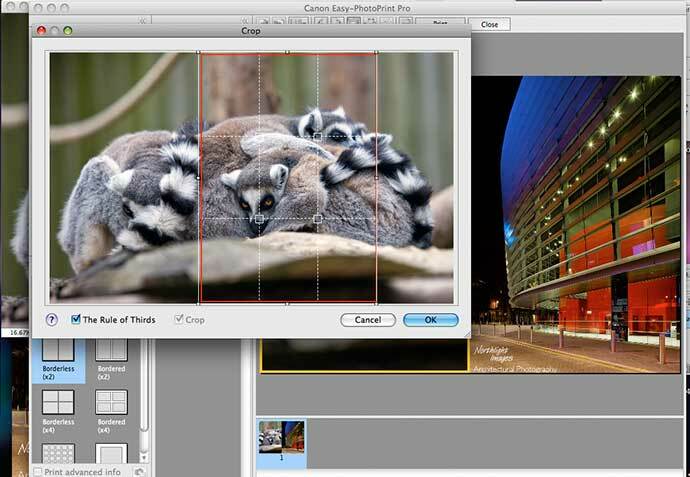 This review looks at a Canon 9500 ii driven directly from Photoshop and using an Apple Mac. Functionality is virtually the same if you were using a Windows PC. This review specifically looks at using the printer for highest quality print output. It comes with some additional software and features for windows based PCs, which we’ve not covered in detail, since we tend to concentrate more on print quality and a fully colour managed workflow. What do you get with the Pro9500 ii? A3+ is 13″x19″ which is a good size for prints, and should quickly convince you that A4 is rather small for prints, and that maybe you need to raise your game in terms of image quality for printing at this size. The printer does allow for slightly wider 14″ paper via the front loading slot (14″x17″ is available), although A3+ is the size you are most likely to find available. 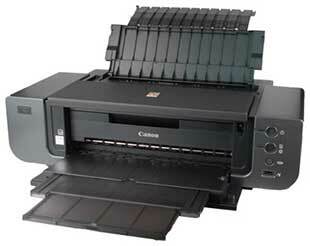 The printer is the latest in Canon’s range of pigment ink desktop printers. It weighs in at just over 15kg (33lbs) and comes in a packing box that should not be too bulky for most people to shift unaided. 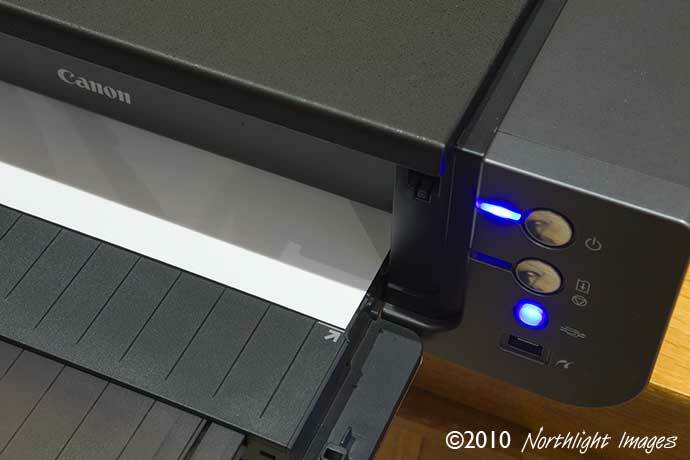 If you are using the front paper feed slot (for ‘art type’ papers) then you will need to pull the printer forward and allow enough room at the back for a sheet of paper to stick out. The example below shows an A3 sheet of art paper (Museum Etching) that has been fed in from the front and readied for printing. Move your mouse over the image to get an idea of the amount of space needed around the printer. The review unit we received was already working, so we didn’t have to install the print head unit or inks to get it going. This is a one off setup procedure that should only take a few minutes, but do be careful to remove all the various packing tape used to keep things from moving during shipping. Also, be careful to get the right cartridges installed in the right place. Note the red LEDs on the corner of each cartridge, these flash to indicate low ink and go out for a cart that needs replacing. The printer will also perform an automatic print head alignment when initialised. This is also available as an option in the printer utility software. Previous experience suggests that it might be worthwhile repeating the procedure once your first cartridge of ink gets used up, and the print heads are well ‘bedded in’. 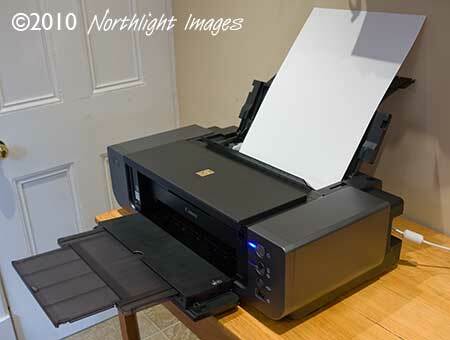 First impressions of the printer are that it is solidly built – no plastic feel. There are lots of nicely designed aspects of the printer, such as the damped front and rear paper trays. OK, it doesn’t matter to print quality that the front tray doesn’t drop into place suddenly, but it suggests that if that much care has been given to such features, then care has gone into the whole design. I tested this on several visitors to the office, who were all suitably impressed, before seeing a single print. I mentioned that if you are using front fed paper, you might need to move the printer to make room at the back. 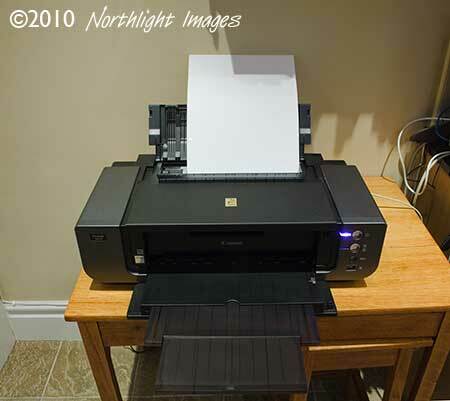 By lifting the front of the printer, two small wheels at the back enable it to easily slide forward. Simple, and well thought out. 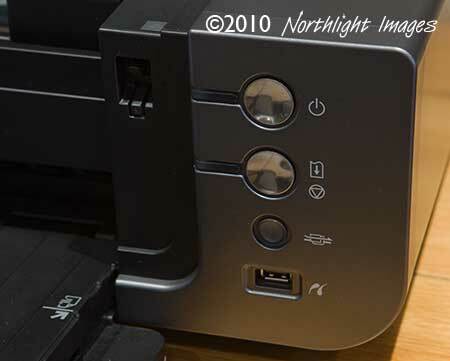 A single USB2 port is provided at the rear. Ethernet connectivity is not available – even as an option. The only controls are the three buttons at the front. Power, paper feed and the smaller front feed button. The printer software is simple to install and includes a comprehensive online manual and help software. I also installed the printing plugin for Photoshop, which allows for direct printing of images without going through the normal Photoshop print dialogue. There is additional software for CD printing and direct printing of images. For normal weight papers you can use the top paper feed slot. The picture to the right shows a sheet of glossy photo paper loaded, and the front tray extended to catch it when done. For lighter papers you can load up several sheets and the pick up mechanism will feed sheets as needed. I tested this with a small stack (10) of sheets of A4 photo paper. No misfeeds or marks along the bottom of the paper. During the entire test of the printer, producing dozens of prints on all types of papers and sizes, I didn’t get one single misfeed. There is a special holder for printing on CDs, this is stored in a slot under the printer. Do make sure you use CDs that take the ink properly, since I’ve found that some don’t dry well and smudge. All the various panels and flaps fold away nicely, so that the printer does not take up so much desk space if you are using smaller papers. Move your mouse over the image to the right to see the extended guide flap. The front tray has a lower position for normal printing and a raised position for direct front feed of thicker papers. The printer detects the movement of the front tray and whirs and clicks for a while, moving various internal parts for the different paper path. 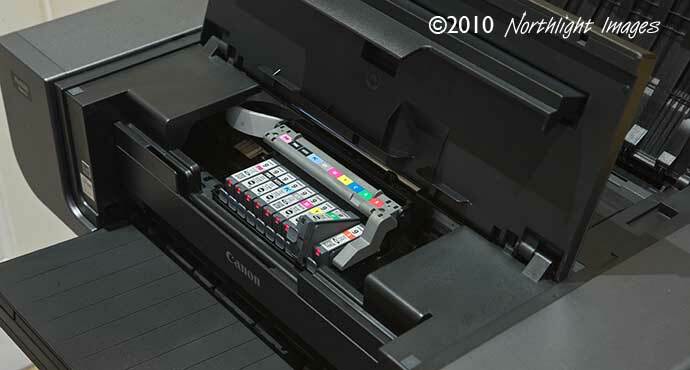 Before you insert paper into the front slot, the ‘straight through’ print button needs to be pressed. After this, you can feed in a sheet of paper at the front. The straight through print path can take media up to 1.2 mm thick. I’m not sure, but it seems that when paper is loaded this way, the printer sets the print head height automatically, since there are the usual whirring sounds once more, when the paper is moved to the back of the printer. There is an alignment mark on the front tray for placing paper before it’s loaded. You press the lit blue button at the bottom to load the paper. I’ll admit to a certain amount of impatience at having to do this procedure many times for printing a few sheets, but the important thing to notice is that I didn’t get -any- misfeeds. A 13″x19″ sheet of paper needs some space to load. Move your mouse over the image to see the print – it’s a wheat field in north central Oregon, and the muted colours work a treat on this sheet of Canon Fine Art Photo Rag paper. 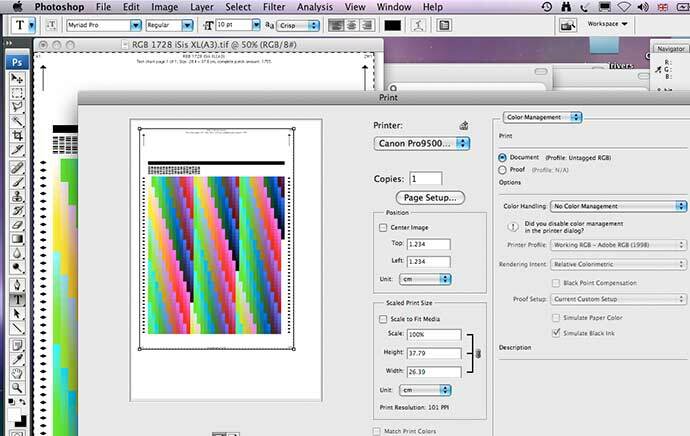 The printer software installation includes ICC colour profiles which give good results with Canon papers, but I wanted to see what papers were like after custom profiling. 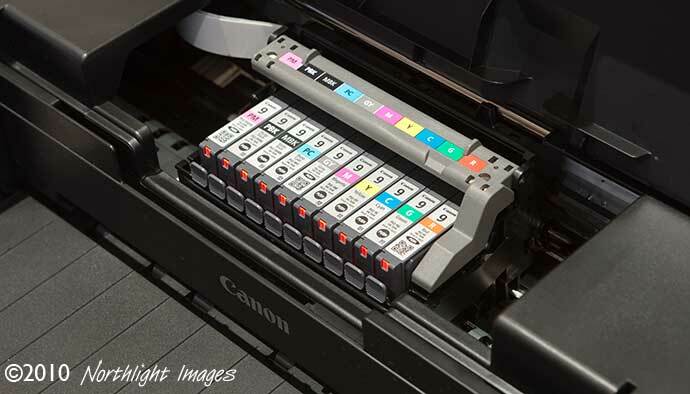 There is a good range of media types, but as with most printer drivers there is precious little information on what the different settings change. Fortunately there is no need to swap black ink types, so you can print both matte and glossy papers without any changes needed at the printer. 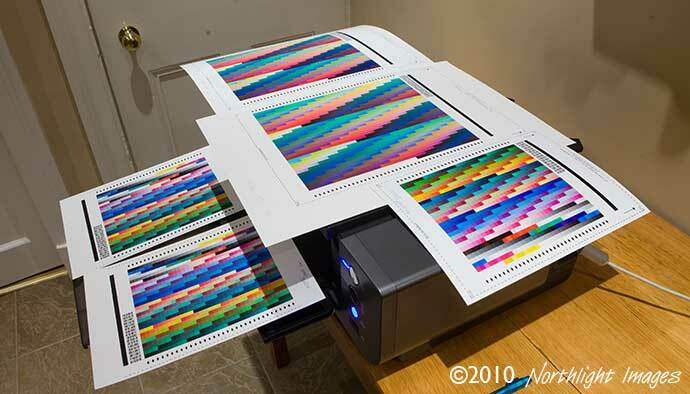 Printer profiling is carried out by printing a coloured test image, with colour management turned off. If you are used to making profiles then you can learn a lot about how a printer is going to perform just by visually checking the test print. I’m printing this target on an A3+ sheet, to measure with an i1 iSis scanning spectrophotometer. I’d just put a sheet of Photo Rag paper in the top paper slot. Even though this paper is a relatively light 188gsm, it needs to be fed in via the front slot, and with a large margin set for the top and bottom. After setting the Margin 35 option, I was able to print. Even for larger sheets of paper, these margins restrict your image size. Move you mouse over the image below to see how much print are I lost for a particular test image, at the size I wanted to print it and the size the printer was happy with. Anyway, with a bit of experimentation, I’ve ended up with a whole load of profiling test targets, which I’ve used to build profiles with. I’ve profiles for Museum Etching (FA-ME1), Photo Rag (FA-PR1), Premium Matte (FA-PM1), Platinum glossy (PT-101) and Photo Paper Plus (PP-101). If anyone wants to try them, then drop me a line. Note that these are for personal experimentation use only and may on no account be used or distributed commercially. We also have profiles for the 9500 mk2 built for four more fine art papers, described (with equivalent paper types from larger suppliers) in our short review of Pinnacle art papers. When printing with a profile, the colour controls are not available (greyed out below). You would not normally want to use these controls when printing. In the example below, I’m printing via the Photoshop print dialogue, using Museum Etching paper – a heavy art paper, with slight surface texture and a good heavy weight. Note too, the ‘Grayscale Printing’ checkbox. This prints in a special greyscale mode for black and white, which I’ll look at shortly. 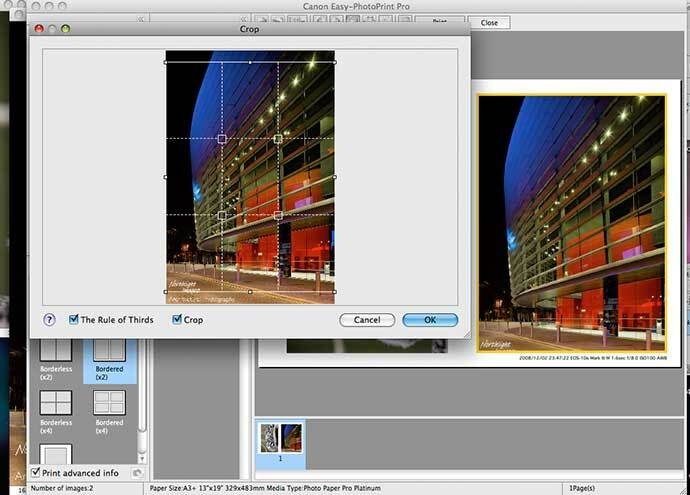 You don’t have to print via the Photoshop print dialogue, there is a plugin that supports direct printing. It’s accessible from the File>Automate menu. The first thing I noticed is that it has defaulted to opening both images that I have open at the time. I’ll just go over some of the key features I noticed. 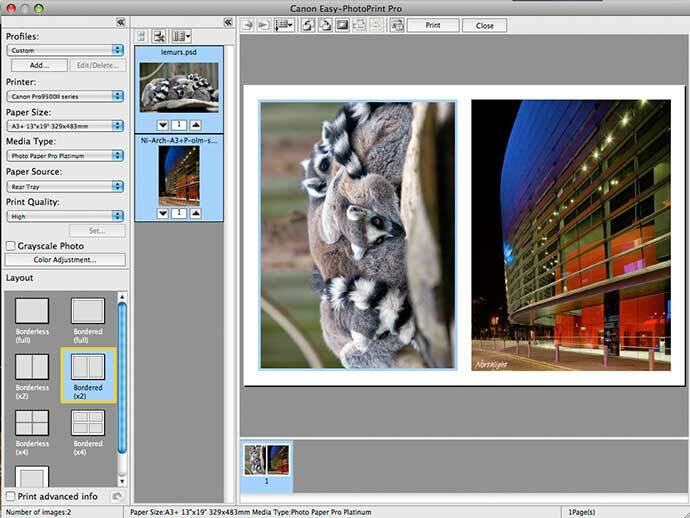 For the example above, the plugin has taken two images and cropped them to fit on one A3+ sheet of paper with borders. The images have been automatically rotated and cropped to fit the available space. Since both are full frame shots, they have each been slightly cropped along the longest dimensions. You can specify the crop more accurately if desired. You can use ICC colour profiles, although only Perceptual and Relative Colorimetric are available as rendering intents. If you need to do proofing then use the normal Photoshop print dialogue. The plugin does depend on you not altering print options from defaults. Rotating a print allows for an even tighter crop of these resting lemurs. 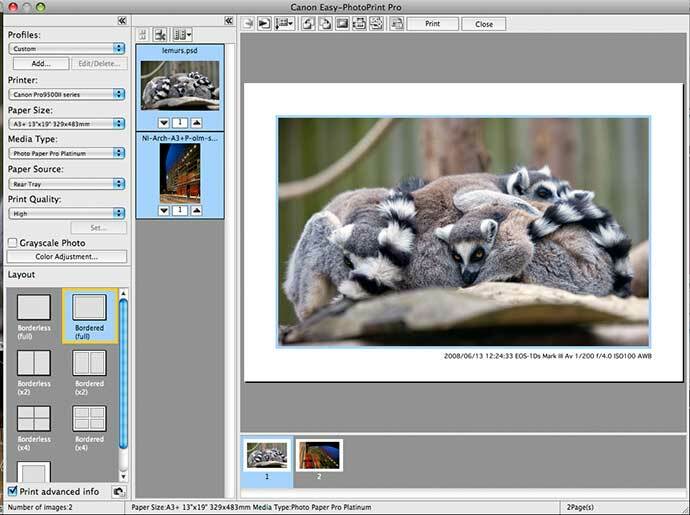 For the example below, I’ve selected true borderless printing and cropped just the middle of the lemurs. Using the glossy photo paper, borderless printing works just fine. 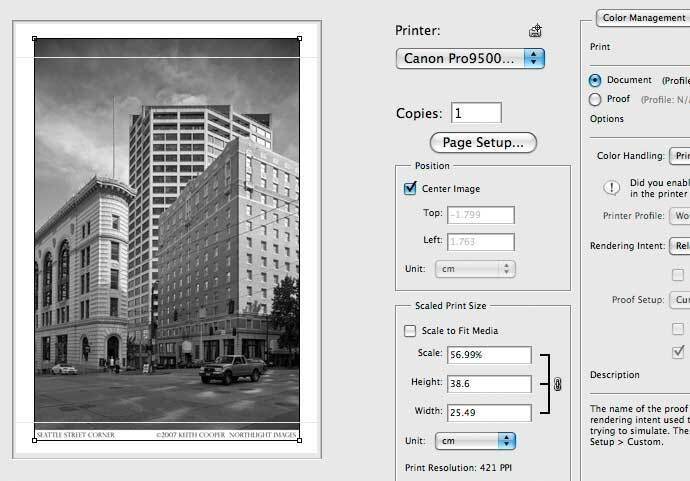 It’s just as easy to print single images where there is full control over margins and position. There are some very strong colours in the night time shot of Leicester’s Curve theatre. These were reproduced very well on both the glossy papers I tested. 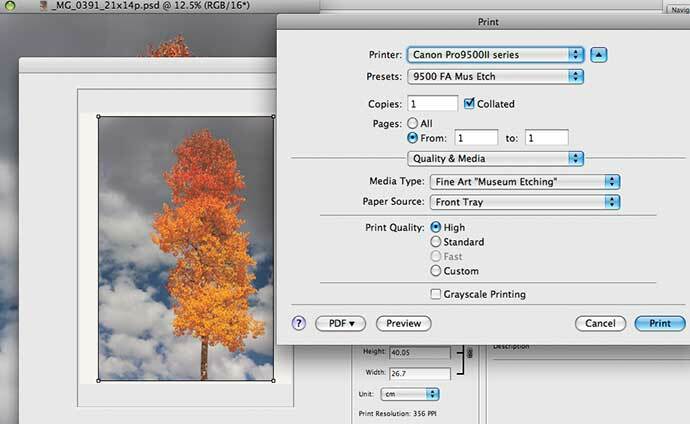 If need be, you can print additional image information from the file’s metadata. Even if you normally print from Photoshop, it’s worth trying out the options available in the plugin. It’s the sort of stuff I wouldn’t use that often, but when I did, it would save me a stack of work. 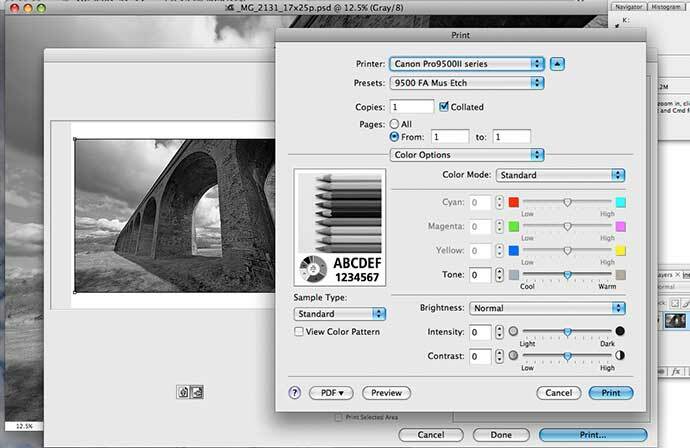 The plugin offers additional colour correction options (‘Color Adjustment’ above) which allow you to pick a portion of the image and tile it on a test print with colour variations (‘Advanced Pattern Print’). Not an approach I’d personally use for my print workflow, but an example of the wide range of functionality included in the supplied software. 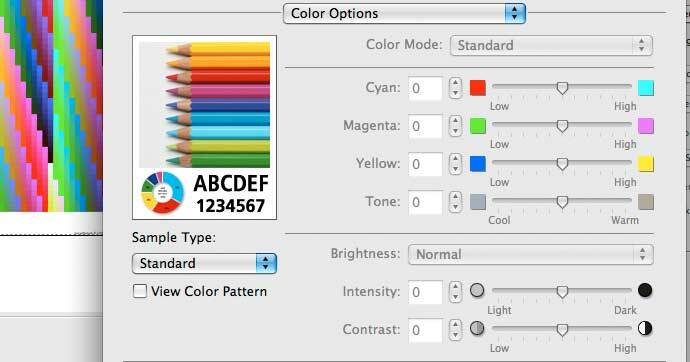 The colour options are greyed out, but there are ones for tone and brightness/contrast. I tried a number of settings and paper types, and found that the printer produced very good neutral and even toned B/W prints. Toning works, but not being a fan of such effects (for my work) I can’t say much more. After a few prints I decided to print some step wedges to measure and check whether the linearity of the printing was as good as it looked. The step pattern is printed in greyscale mode, with colour management turned off. The photo rag and premium matte papers were pretty much spot on, however the museum etching paper was a bit too dark in the shadows. Note QTR is an excellent shareware package, and although it does not directly support printing to Canon printers, it does allow the creation of correction profiles for any B/W print setup. First, premium matte – pretty much spot on – a nice straight line. Secondly the Museum Etching – notice the bend to the left further down the line – this suggests that mid dark shadows will be a bit too dark. After creating a QTR correction profile, I printed the image below, using the QTR_9500-fame profile, with greyscale printing selected in the driver. 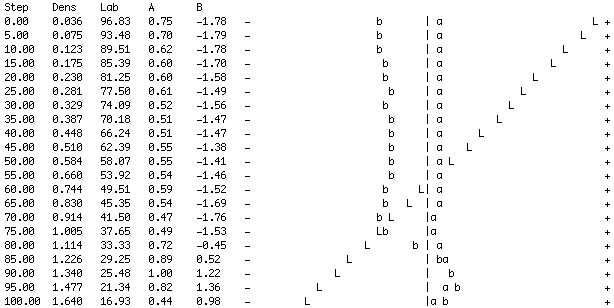 OK, if you’ve stuck with me past the graphs, the question is: Do I need to do all this profiling stuff? Fortunately the answer is no. So for ‘out of the box’ monochrome printing I’d be more than happy enough to accept what the printer gives me. Note that this is for Canon papers. I did test some third party papers, but I’ll cover them in another article. Suffice to say, once you move to 3rd party papers, the benefits of custom profiling for colour and black and white are often more readily apparent. 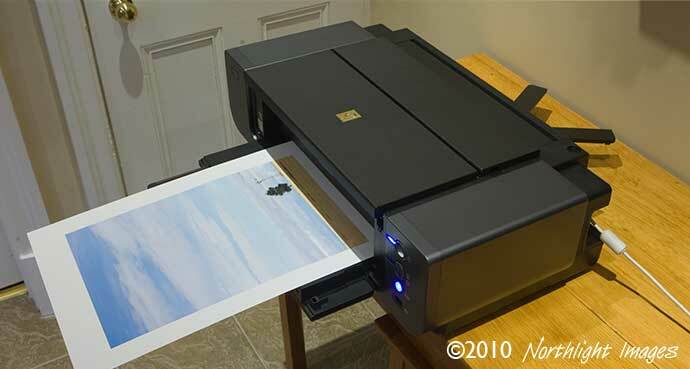 If you’ve previously been using a basic A4 printer for some prints, then moving up to a printer like this should make a big difference to your printed work. However you will quickly find that bigger prints can need a lot more work preparing them. 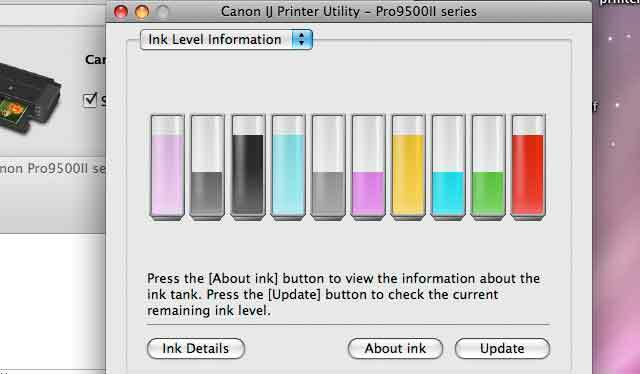 Ink levels can be checked via the printer utility software. My first thought when seeing this display was that it just looked too neat – there are not enough different levels making up each bar. After printing all the printer profiling targets, the green ink ran out, followed five prints later by the grey. The window on the side of the cartridge (right) shows the cartridge looking pretty empty. Even though there are low ink warnings, the coarseness of the display just didn’t give me a good ‘feel’ for ongoing ink usage. 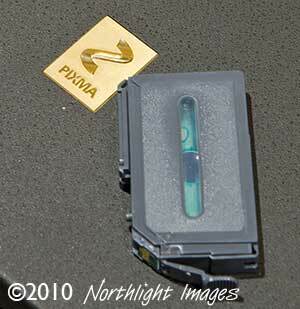 Accessing the ink cartridges for replacement is very easy. Once the printer decided it needed ink, you have to replace a cartridge. Below, I’ve lifted out the green ink cart ready to swap it for a new one. You can see the LEDs at the corners of the cartridges – I’d personally rather not see LEDs incorporated into a plastic box I’m going to throw away. 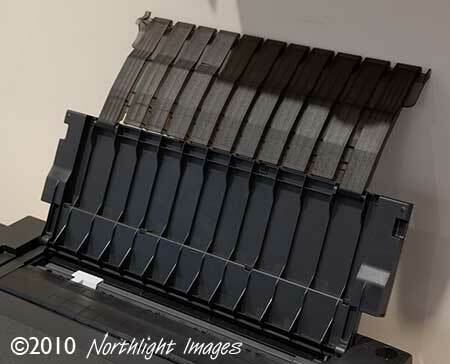 The cartridges don’t hold a terribly large amount of ink, but there are ten of them so the total amount of ink in the printer is a more reasonable quantity (but still only slightly more than just one single ink cartridge for the iPF6100). I’ll come back to ink usage issues in the conclusions, but there is more detail in the [Canon supplied] specifications at the end of this review. Suffice to say, I’d suggest always keeping a spare set of inks if you are doing regular printing. It’s worth noting that the printheads in this machine are a user serviceable part. At some time you will have to replace the printheads – I’ve seen no reliable estimates of their lifetime, but in looking for user reports of issues with the 9500 ii, I’ve come across no printhead related problems. It’s difficult showing print quality in a web article. I just don’t find much utility in vast lists of measurements and gamut charts. 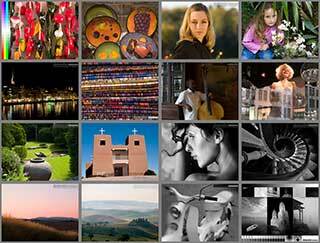 I’ve printed several dozen images at a variety of sizes on different Canon papers – no problems in printing any of them. The images were sharp and crisp, showing no obvious over inking or spurious patterns. 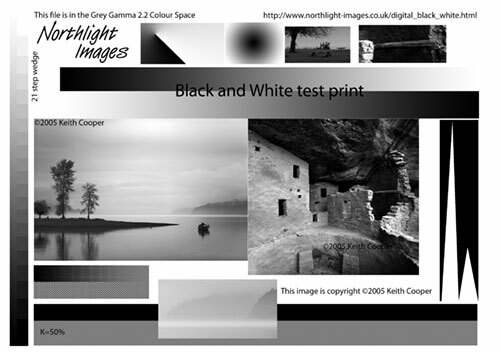 For looking at colour and black and white performance I’ve initially used the Datacolor test image for colour, and my own black and white printer test image. Different papers suit different images. 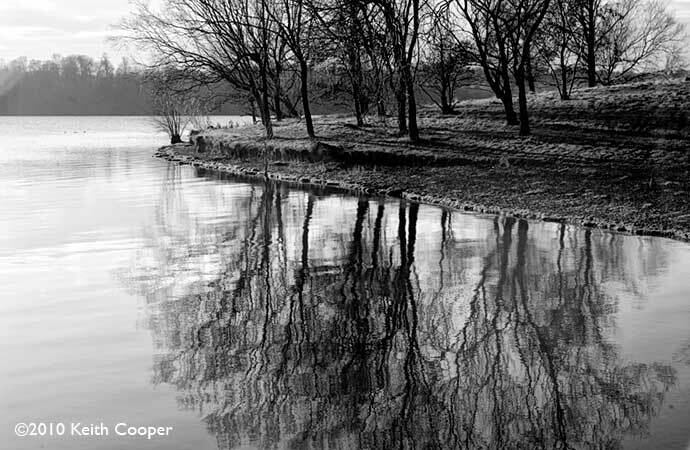 Although my first inclination would be to print the reflections image below on an ‘art type’ paper, the mass of detail in the reflections worked very well on the much whiter and smoother premium matte. Given the limited number of sheets in most sample packs, I’ve now got initial quick testing down to 3 sheets – one for a colour profile, one for the Datacolor test image and one for black and white. If the sheets are big enough I can fit a linearising target and two prints of my b/w test image on A3/A3+. The Pixma Pro9500 Mk2 is one of the more solidly built printers of this size, and the attention to detail in overall design is obvious from the start. 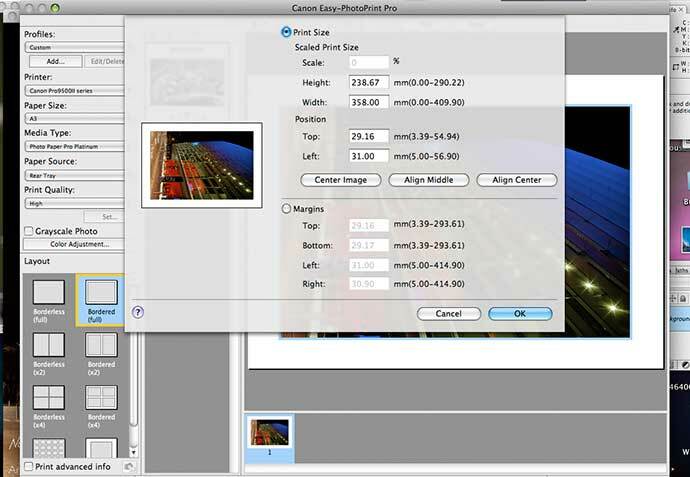 It is generally easy to use and the supplied software makes printing straightforward, even if you are not going through the likes of Photoshop or Lightroom. 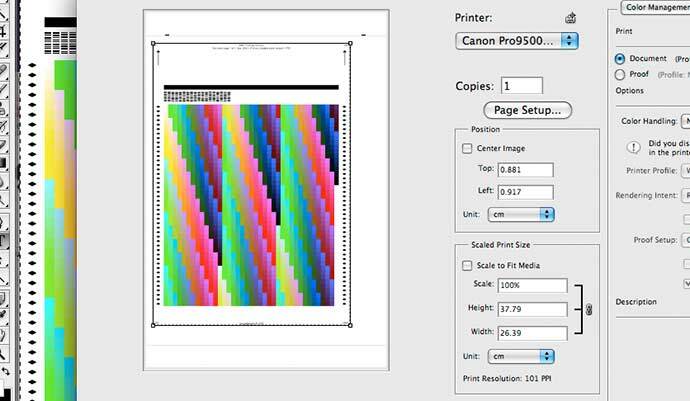 16 bit printing is available in some print setups, such as through the plugin. However, it’s worth noting that few images I’ve ever seen show a perceptible improvement. That’s not to say it’s a bad thing – just that the normal 8 bit printing looks good as is. Ink cartridges are easy to replace, requiring little effort. Print quality for both black and white and colour were excellent, with glossy prints showing little gloss differential (dull areas of prints) and the printer driver greyscale print mode giving good neutral and even prints. 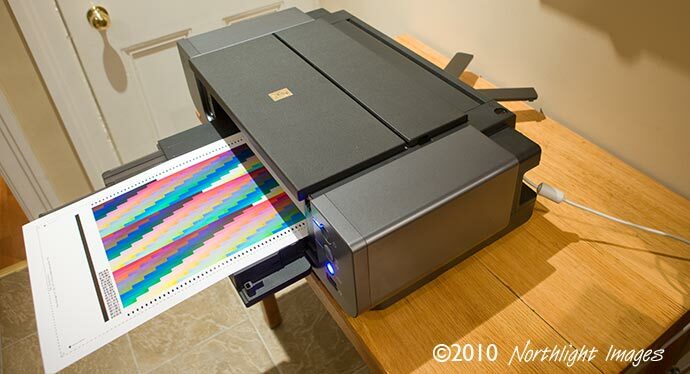 If you are thinking of buying such a printer, do try and find some sample prints to look at, since this gives a far better feel for what it is like than any number of graphs and ink gamut diagrams. One feature of note is that you do not need to swap black inks for changing paper types – worth noting if you regularly use a variety of paper types (as we do here at Northlight). The granularity of the ink display in the software utility caused me some concern in the way that it jumps from one level to the next. I’m sure that with experience you get a feel for total ink usage, but the display, with its jumps, is not overly user friendly. To their credit, Canon publish ink usage figures (in the specs below), but to be honest, I’ve read them several times and can’t say I’m much the wiser. Given that the printer was supplied already loaded with cartridges with unknown ink levels I can draw no useful conclusions about its initial ink usage. However where I did replace cartridges, levels went down after a few A3+ prints. 9500 mark II ink cart capacity is 14ml. All I can say is that ink usage seems on a par with other printers of this size. If you are doing lots of prints, then it could well be worth looking at Canon’s larger printers, such as the iPF6100 I reviewed last year. 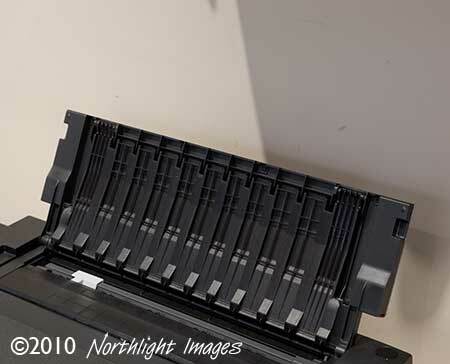 The printer uses quantities of ink on start-up for cleaning and maintenance – I’m not sure how much, but it does mean that ink levels will gradually go down, even if you don’t print very often. The prints I made showed no problems with clogging or uneven ink coverage – there are a number of cleaning and maintenance actions available in the printer utility software, however I had no cause to need them. The estimated lifetimes for the Lucia pigment inks are easily up to the archival standards I insist upon for my exhibition prints. A lack of Ethernet connectivity is a bit of a disappointment, since I’d suspect that many users of this sort of printer might have more than one computer they work from, or even have the printer at some distance from where they are working. It does show that this printer is also aimed at some aspects of the ‘consumer’ market, and to provide support as a general ‘office printer’ to some extent. The front feed path for paper is a straight through one, which is good for heavier papers. There is no support for roll media. The printer makes very nice borderless prints on glossy paper, however it seems determined to make up for this when printing fine art papers by imposing a huge 35mm margin at the start and end of each sheet. If you’ve looked at some of the screen shots above, you’ll realise just how big this is. On an A3+ print it’s similar to what I might use anyway. On A3 it’s a bit big for some print uses I might want. On A4 it drastically eats into print area. I have some cut sheets of art papers, ready made for greeting cards – these are effectively useless, since 35mm eats into the print space so much. The only way round this, that I’ve come across, is to use the Matte paper setting, however this may not be the optimum media setting for profiling a particular paper. 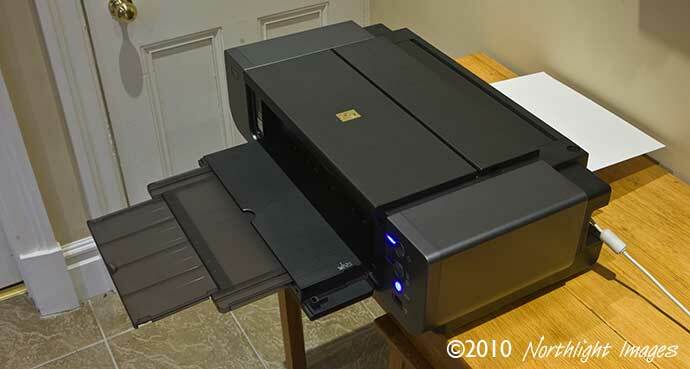 This and the amount of time the printer spends whirring and ‘doing stuff’ when waiting to feed paper in at the front would be my two main gripes – do remember though, that I normally print on large format printers and A3+ is one of my smaller print sizes. We make a specific point of not selling hardware, but if you found the review of help please consider buying the 9500, or any other items at all, via our link with Amazon. 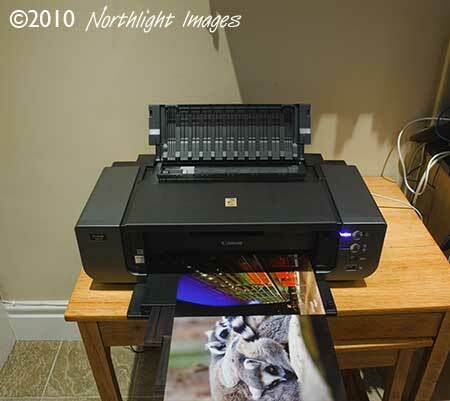 I see this printer being aimed at the more advanced consumer and amateur photographer market. It has enough simplifying features (and software) to appeal to those without the time and/or inclination to make the effort to understand the nuances of fine art printing, yet it has the ability to allow really high quality prints for those wanting to take their printing up a level (several actually). 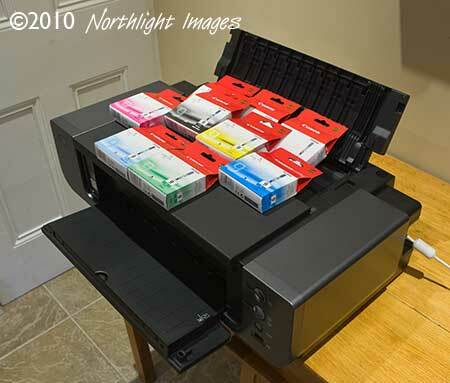 If you worry about ink costs and only do a few prints a month then perhaps a cheaper printer may be better suited – printers like this benefit from regular use and not sitting idle. If you were regularly producing prints for sale, then the economics might suggest a bigger printer, such as the iPF6100. 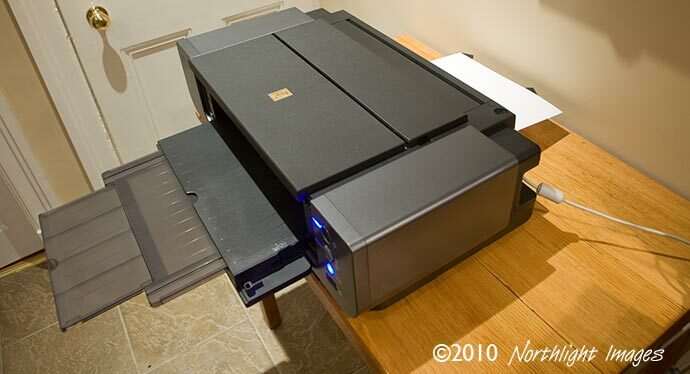 However, if you’re a pro photographer looking for top quality portfolio prints, this printer has what it needs. An A3+ (13″x19″) pigment ink printer that can produce extremely high quality prints on a range of paper types. The 10 ink system means no swapping of black inks for paper types, whilst the range of additional colours give a good even coverage. 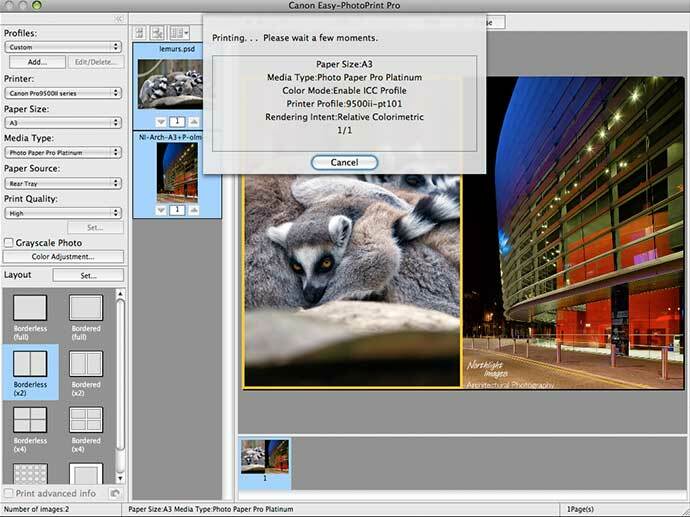 Supplied with a range of additional software, including a plugin for direct printing from within Photoshop. Black Ink Tank Life ¹ Declared yield value in accordance with ISO/IEC 24711. Values obtained by continuous printing. ² When printing Canon standard photos continuously on 10x15cm Canon Photo Paper Plus Glossy II with the default settings, using Windows Vista printer driver in borderless printing mode and Windows Vista Home Premium Photo Gallery. Declared yield value determined based on Canon standard method referring to ISO/IEC 24711. Colour Ink Tank Life ¹ Declared yield value in accordance with ISO/IEC 24711. Values obtained by continuous printing. Interface Type – PC ¹ Operation can only be guaranteed on a PC with built-in USB or USB 2.0 Hi-Speed Port and pre-installed Windows Vista, Windows XP, Windows 2000, Windows Me or Windows 98.